This pot roast is a snap to fix; just drop the ingredients in the slow cooker, set it, and walk away for a while. Use the drippings to make a delicious gravy if you'd like. This slow cooker pot roast takes all day to cook, but only 3 or 4 minutes to prepare. Condensed French onion soup makes this pot roast quick to fix and the crock pot makes it a breeze to cook. This is a fantastic meal to fix for a busy day meal. All you need is a side dish or two, or serve the beef on sandwich buns. Cut the roast into 4 to 6 large chunks and place them in the slow cooker. Add the French onion soup and mushrooms. Cover and cook on LOW for 8 to 10 hours, or until very tender. Or, cook on HIGH for 4 to 5 hours. If desired, make a flavorful gravy with the juices. 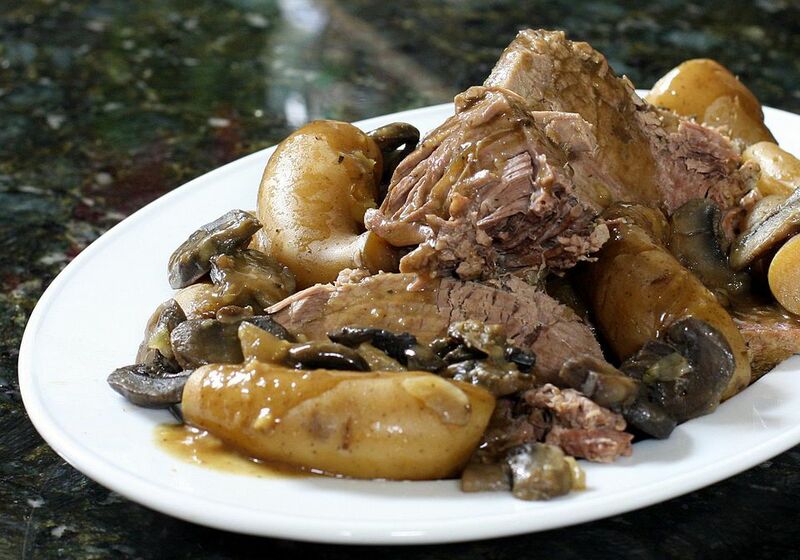 Remove the beef and mushrooms to a platter or bowl with a slotted spoon; keep warm. Transfer juices to a saucepan. Skim excess fat, if desired. Simmer the juices for 5 minutes to reduce slightly and concentrate the flavors. Mix 2 tablespoons of flour with cold water to make a smooth mixture; stir into the juices. Continue cooking until the sauce is thickened and bubbly. Taste and add salt and pepper, as needed. Serve the gravy with the sliced or shredded beef and mushrooms. Serve it with potatoes and vegetables or on toasted sandwich buns with coleslaw and fries or chips.